Now that the equations of motion for the differential drive robot have been introduced, the issue of implementation can be addressed. 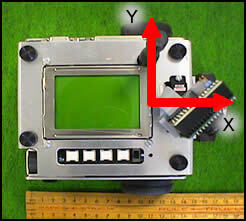 Lets us first define the coordinate system for the robot (this is the local coordinate system). We will choose the origin to lie at the center of the motor axis with the positive x-axis pointing towards the front of the robot and the y-axis lying along the motor axis. This is illustrated in the figure below. For this laboratory, you are required to extend the control to both motors in order to make the robot drive straight and turn about its origin. In order to accomplish this, while using what you have already coded, lets define another structure called 'Turtle' after the turtle graphics programs of the the late eighties. This structure will contain information about the robot's current position, its desired position and the structure will also contain the velocity controllers for the two wheels. You can implement a bang-bang style controller for both orientation and distance. Below is some pseudocode for the bang-bang style controller. This does not include everything you will need for your Turtle contoller, you will also need to determine if the robot should drive backward (Hint: apply the fact that the cosine of the angle between to vectors is equal to the dot product of the vectors divided by the magnitudes). Also all the trigonometric functions you will need can be found in <math.h>.